You know when you see those photos on the internet of extremely detailed nail art and you think ‘Which person actually has time to do this?’. Yeah, I’m that person (perks of having no social life, am I right?). Since I’m also a Halloween fanatic, I decided to try out a few spooky designs and they turned out really well! PS. Apologies for my ugly nails in the photo. You’d think for someone who spends loads of time painting my nails, I’d actually have nice ones. Anyway, I don’t plan on becoming a hand model, I just wanted to give you guys an idea of what the designs look like! 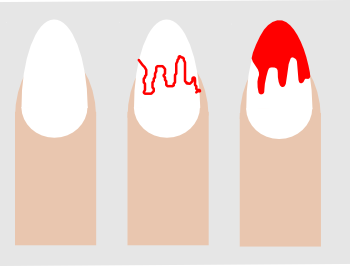 If you’re the type of person who doesn’t like spending ages on their nails, but still wants their manicure to have a Halloween-y vibe, then this fun design is perfect. 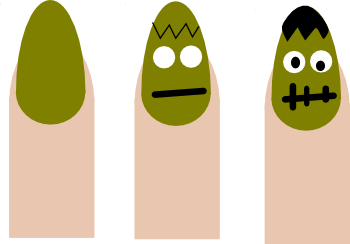 If you have a little more time on you’re hands, you can try out these little Frankenstein faces. Nothing says ‘Halloween’ more than pumpkins! 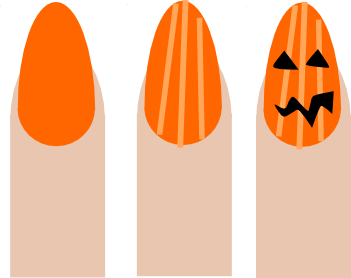 For a really cool effect, give each little Jack-O-Lantern nail a different face.